In “Alpha and Omega,” Supernatural stays true to what matters to them—family. Even the surprises they throw at us reinforce the importance of familial relationships. Supernatural has been able to stay on the air for over a decade by giving us scary monsters, but grounding it in the special bond between Sam and Dean Winchester. Throughout Season 11 we saw the power of family relationships—not just in the Winchesters, but through Chuck and Lucifer, Rowena and Crowley, and God and the Darkness. The Season 11 finale “Alpha and Omega” culminated with Dean getting what he needs the most—his family. Supernatural knows we love monsters, the battle between good and evil, and witty metafiction, but that it’s the bonds of family that keep us coming back. Back in the Season 5 finale “Swan Song,” Chuck told us, “So, what’s it all add up to? It’s hard to say. But me, I’d say this was a test … for Sam and Dean. And I think they did all right. Up against good, evil, angels, devils, destiny, and God Himself, they made their own choice. They chose family. And well … isn’t that kinda the whole point?” Six years later, Chuck’s words become a bit more complicated given that his own family has become a bit of an issue. However, in the Season 11 finale, Amara, with a little prompting from Dean, chooses family, saving Chuck and everything He created. Dean recognizes what’s underneath the revenge that’s been driving Amara since she escaped the Mark—that Amara doesn’t want to be alone. Dean tells Amara that he and Sam would fight, but they always made it right because they’re family: “I need him. He needs me. And when everything goes to pot, that’s all that matters: family.” When God and the Darkness resolve their family conflict, it saves both of them, as well as saving the world. Amara leaves a gift behind for Dean, recognizing what he needs most—his mother. The visit to Mary Winchester’s grave when Dean expects to die foreshadowed her return without diminishing any of the excitement of seeing the long-dead Mary back from the grave, wearing the very nightgown she died in. We learn that right now it’s not a soulmate, children, or a normal life that Dean needs, but his mother. Crowley and Rowena never come to terms with what’s happened between them, but they do manage to establish a détente when the end is nigh. As the B team waits in The Lazy Shag bar for Dean to set off a soul bomb on Amara, the mother and son sit comfortably next to each other at the bar. It’s not a permanent peace, more like when Ralph E. Wolf and Sam Sheepdog punch out on the time clock. If the world doesn’t come to an end, you can be sure these two will continue to be enemies. Yet it’s still a little heartbreaking to watch Crowley’s well-contained anger and listen to his jibes. Rowena ignores her son to make tea for God, and you can feel that perhaps, like Dean, Crowley just needs his mother. In the Season 8 finale, he told us as much, exclaiming, “I deserve to be loved. I just want to be loved,” as Sam made efforts to cure Crowley of his demonic nature. Who knows what Season 12 has in store for these two? The Winchesters have very different reactions to the failure to contain Amara. Dean just wants to get drunk, while Sam is determined to find a way. We get to see why we love each of these brothers: Sam for his eternal hopefulness and strong will; and Dean for his loyalty, as well as the anger and despair that can overtake him. The Supernatural viewer who stays in the present moment gets the most from the series. Yes, we know the world can’t really end because Season 12 has already been scheduled, and you can’t kill the Winchesters for long because they’re the main characters. But that’s not what it’s about. It’s about experiencing the moments of loss along with Sam and Dean as they deal with the fear of losing each other and grief. The fact that we know the brothers can come back doesn’t make us feel any less sad when one of them faces death. This is owing to the manner in which their stories emphasize family and loyalty as much as it is to the impressive acting skills of Jared Padalecki and Jensen Ackles. The scene in the graveyard when Sam and Dean say goodbye broke our hearts, again. Seeing the boys stand in front of their mother’s grave as Dean prepares to face the Darkness provided an emotional touchstone. It was refreshing to see both brothers resigned to Dean’s sacrifice, rather than his choice causing conflict. Sam doesn’t even object to the plan. Lucifer’s departure gave us the benefit of some emotional moments between Dean and Castiel. Dean tells Cas, “You’re the best friend we’ve ever had. You’re our brother, Cas. I want you to know that.” We won’t lie, we got a little worried that somebody was going to die when we saw this scene. In the midst of resolving the season’s story arc, Supernatural finds time to give us a monster hunt. Seeing Sam and Dean collect ghosts at the Waverly Hills Sanatorium, a historic building in Kentucky, added the hunt element we love in Supernatural. “Alpha and Omega” also reminds us that Billie the Reaper is still out for vengeance, despite showing up to help forestall the end of everything. Sam and Dean haven’t exactly cleaned the slate of their past misdeeds, including killing Death. It also appears that Crowley and Billie know each other, which we’re eager to learn more about next season. Sam and Dean have also managed to make enemies in the London branch of the Men of Letters. It seems that bringing the world to the brink of destruction a couple of times puts you on their list. Doesn’t managing to stop the end count for anything anymore? The scenes in London and at the airport took us out of the story, and not in a good way. Also, we’ve been traumatized by “Bloodlines,” so when something like this happens we start worrying that they are planning a spin-off, or possibly a Doctor Who crossover. The title “Alpha and Omega” refers to the Book of Revelation. Alpha and Omega are the first and last letters of the Greek alphabet. Christ states that he is the alpha and the omega, referring to being both the beginning and the end. This reflects the creation and destruction elements of God and the Darkness. “Alpha and Omega” writer and Season 12 showrunner Andrew Dabb wants to give us something to look forward to next season. Dabb is taking a page from the playbook of show creator Eric Kripke by introducing elements that will pay off in a later season. He lacks the subtlety of Kripke, but we appreciate the effort. It’s hard to be in the shadow of a man that had the foresight to plan out a five-season story arc. Future seasons could bring us the return of Lucifer as well. Though Amara ripped him out of Castiel, we’ve no evidence that he’s dead. In fact, we’re pretty excited that Chuck survived as well. Just this once, everybody lives! Mark Pellegrino, Rob Benedict, even Emily Swallow—there’s a whole host of characters that could return. Now if only Richard Speight, Jr. would show up, and not just as a director, but as the trickster Gabriel. Director Phil Sgriccia and cinematographer Serge Ladouceur give us unusual camera shots as Cas and Dean go on their beer run. They also create interesting interior shots in the sanatorium and the London home, as well as a beautiful cemetery scene with falling snow. “Alpha and Omega” also gave the visual effects department a chance to show their stuff with ghosts and souls zipping around. In “Alpha and Omega,” the good news is that Dean survived, but the bad news is that Sam never got to ask God about why ears are so weird. Sam wasted all that time at The Lazy Shag asking Chuck if he was feeling okay when he could have been learning why God made the planets round. 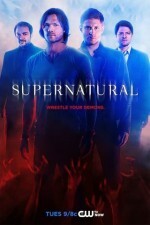 The good news for fans is that Season 11 gave us an outstanding season with a good finale in “Alpha and Omega,” but the bad news is that now we have to wait until October for the Supernatural to return.